Check this below video to know more about the post adding steps. You can continue reading to know more about the features of post section. In the title section of the post, you need to write the title of the post. You can use words, phrases or characters. Avoid using the same title for more than one post. Every post title must be unique to avoid conflicts. You can use the hyphen, quotes, apostrophes and other symbols etc. Below the title section, your post section has Content Box section. You can write all the content in this content box section. In this box, you can write or paste your writings, add images, manage links, change headings, colors, and links, blockquotes etc. You can switch between Visual and Text editors. In Visual mode, you can visually manage the content but in Text mode, you can write HTML tags also. After adding the title of the post, WordPress itself create permalinks for your post. You can customize the permalinks for the post via permalinks section, below the title field. For more settings about permalinks, you can check Settings > Permalinks of admin dashboard. 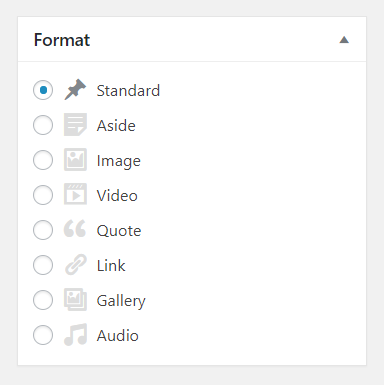 You can add images and media files in the content box. Click on Add Media Icons in the content box section, select the image from the library or add from your drive. You can add audio, video, images etc. This is a menu located on the top right corner of the post and page section of WordPress dashboard. You can enable/disable various options available on post and page. You can show or hide comments, featured image, excerpts, custom fields, tags, categories etc. If any of the features hides, you can check the screen options. Most of the WordPress Themes support featured image for page and post. The image helps to identify the post nature and enhance the post weight. It is recommended to use the featured image for the post. You can see the options for featured image on the right low corner of the admin dashboard. 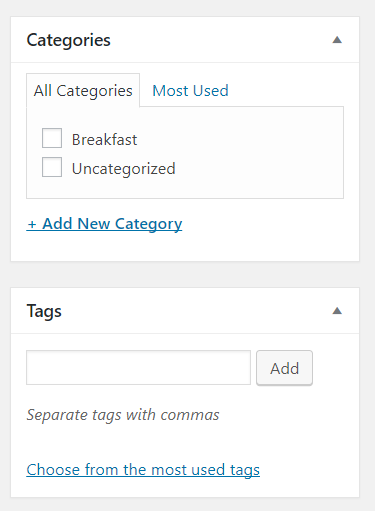 Categories and Tags in WordPress help to sort the post. The categories and tags section boxes usually appear on the right section below the publish box of post dashboard. Categories usually help your visitor to find the post with specific categories. Example: – Sports, Politics, National, International, Technology etc. are the examples of post categories. After adding the complete content on your post section, you need to either save the post in the draft or need to publish it. If the post is complete, you can publish it or if it needs more revision, you can save the post in drafts. Draft posts will not visible to your visitors. From the publish section, you can change the post published date and time, password protected the post, private post, sticky post etc. Check all the available options in the publish section. Some theme comes with post format features. Post format features help visitor to know which type of post is this. Post format is Standard, Aside, Image, Video, Quote, Link, Gallery, Audio. If your theme supports post format, we recommend you to choose the post format for your post as well. WordPress comes with great tools to create and manage posts and pages. If you need any additional things, you can search for the plugins. There are thousands of free and premium plugins available for WordPress, you can find the best and useful plugin for your need. Hope this blog post is very helpful for you to know how to create the post in WordPress. If you have any feedback, please comment us in be below comment section. Subscribe our YouTube Channel and follow on Twitter for more WordPress resources.